Shot thru a wire mesh and hence slight smudges in places. With its soft-textured white and salmon-pink plumage and large, bright red and yellow crest, it is generally recognised as the most beautiful of all cockatoos. It is named in honour of Major Sir Thomas Mitchell, who wrote "Few birds more enliven the monotonous hues of the Australian forest than this beautiful species whose pink-coloured wings and flowing crest might have embellished the air of a more voluptuous region". Very sweet shot of these two. I've only seen grey !+$%atoos in the past. Love their moment of affection! Nice job shooting through the mesh, lovely shot! And Happy V-Day! This is perfect for Valentines Day. Awwwh - what a great Valentine's Day shot! So perfect. 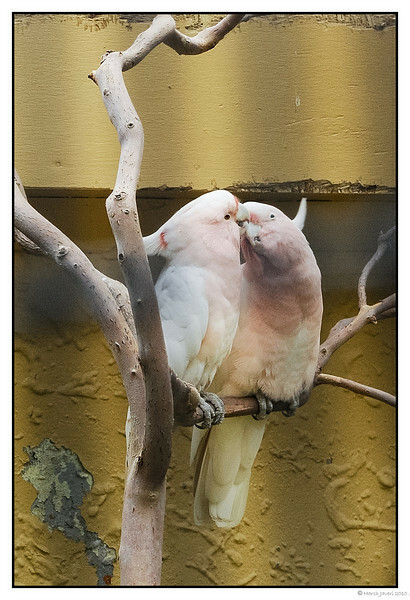 Love Birds are perfect for this day of love! Great capture. Awww, lovely shot -- very approrpriate for today!